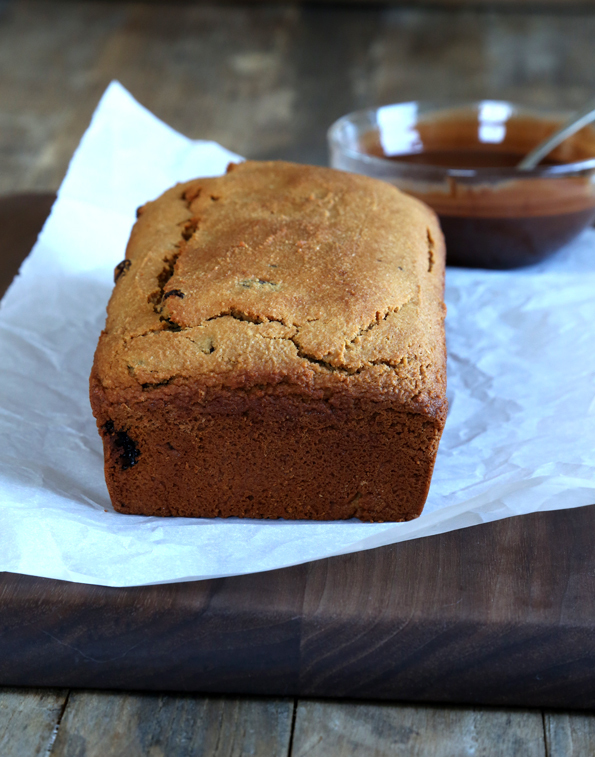 Almond Paleo Quick Bread - baked with humidity so it never burns! 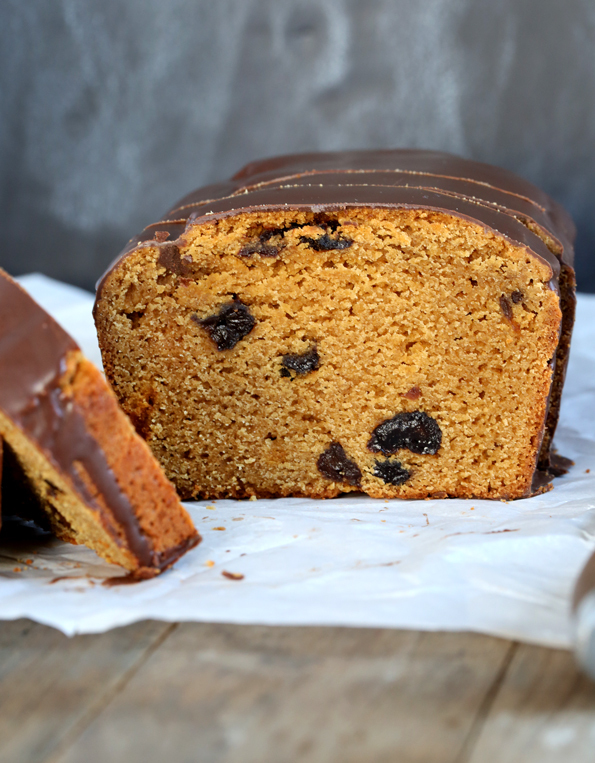 Almond-flavored Paleo quick bread, made with dried cherries and covered in a chocolate glaze. Baked in a special way to ensure that it never, ever burns but still bakes to perfection! 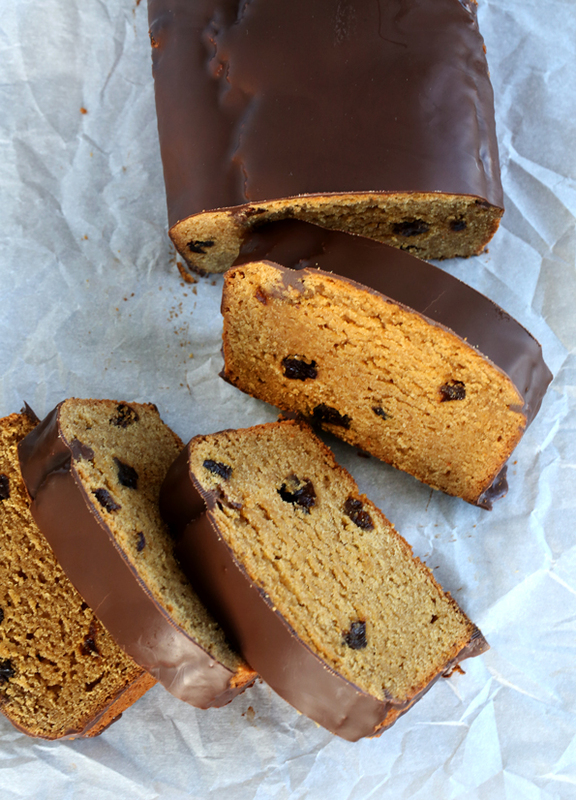 This Paleo quick bread is a bit of an achievement. As I find my footing with Paleo recipes, I’m finding that what I really miss in Paleo baked goods more than anything is for the outside to have a different texture than the inside. If it’s bread, it should be crusty on the outside (like these Paleo rolls). And if it’s quick bread, it should have something of a crust on the outside, too, but it shouldn’t burn. And almond flour has a tendency to burn. We need to make sure that the almond flour doesn’t burn before the quick bread bakes all the way through. That can be a struggle with almond flour baking recipes. That’s why the instructions in this recipe call for baking the loaf farther away from the oven’s heat source, on the top rack. They also call for keeping a simmering pan of water on the bottom rack. 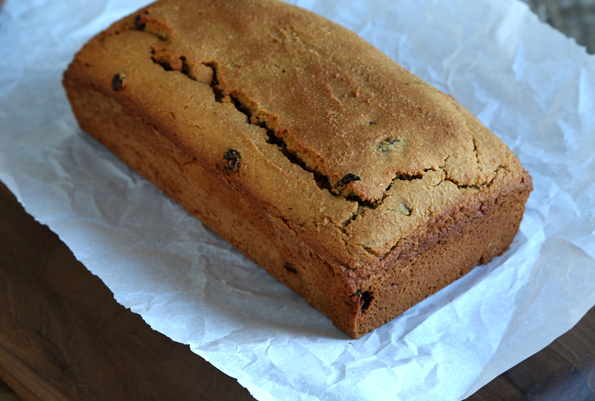 I even tried baking this Paleo quick bread in a water bath. It just took foreeeeeeever to bake and I ran out of patience. but my family ate it anyway because there was no way I was going to throw out all that almond flour! 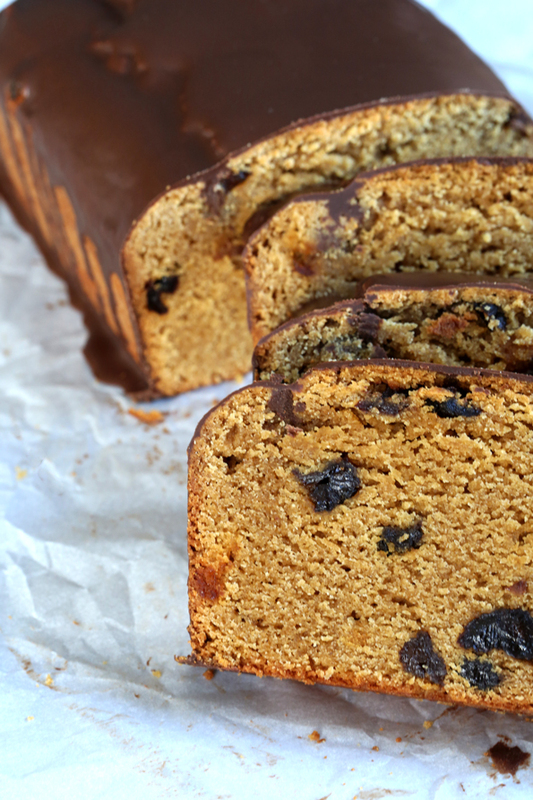 This Paleo quick bread really holds its own. The almond flavor is prominent, for sure. If you don’t want to use the almond extract because it’s not 1000% Paleo-legal, just leave it out. The loaf itself is moist but not wet like almond-flour breads can be. The cherries and the chocolate glaze really balance everything out beautifully. *To make your own Paleo baking powder, combine 1 part baking soda + 2 parts cream of tartar + 1/2 part arrowroot or tapioca starch/flour. Preheat your oven to 325°F. Grease a standard 9-inch x 5-inch loaf pan and set it aside. Place another loaf pan on a rack in the lowest position in your oven, and carefully fill it 3/4 of the way full with warm tap water, and close the oven door. In a large bowl, place the almond flour, coconut flour, tapioca starch/flour, baking soda, baking powder, coconut palm sugar and salt, and whisk to combine well. Remove about 1 tablespoon of the dry ingredients, place in a small bowl with the dried cherries and toss to coat. Set the cherries aside. Create a well in the center of the dry ingredients, and add 4 tablespoons (56 g) of the coconut oil, the milk, eggs and almond extract, mixing vigorously to combine well after each addition.The mixture will be relatively thick. Add the dried cherries and reserved dry ingredients, and mix until the cherries are evenly distributed throughout the batter. Scrape the batter into the prepared pan and smooth into an even layer with a wet spatula. Place the pan on a rack in the top third of your oven, and bake until firm to the touch and a toothpick inserted in the center comes out mostly clean (with a few moist crumbs attached, but not wet like there is any remaining wet batter in the pan), about 1 hour. Remove the loaf from the oven and place the pan on a wire rack to cool for 10 minutes before turning the loaf out onto the wire rack to cool completely. While the loaf is cooling, make the glaze. Combine the chopped chocolate and the remaining 1 tablespoon (14 g) virgin coconut oil in a small, microwave-safe bowl and melt on 60% power in the microwave in 30-second bursts, stirring until smooth. Allow the glaze to cool at room temperature until it begins to thicken before pouring over the top of the cooled loaf of quickbread. Allow the glaze to set before slicing and serving. P.S. Did you know that there is a whole chapter in Gluten Free on a Shoestring Bakes Bread, on Yeast-Free Quick Breads? Pick up your copy today, and turn to Chapter 8! My daughter has celiac disease, and while I would never call it a blessing, I AM thankful it isn’t anything worse. Childhood cancer, Type 1 diabetes, etc. Yes, her diet excludes her from the eating part of social functions. But she is happy, healthy, and doesn’t really feel excluded. I, personally, don’t have any desire to see a wheat-based bread made fully safe for her to eat. And again personally, I would love to see the time and money put toward cancer research, mental healthy research, or spreading the word about celiac disease. There are still SO many kids and adults living with it without realizing it. It does major damage to the gut to eat gluten, but also increases your risk of cancer. Again, just my opinion and I respect yours as well. It is an interesting dialog to have. Maybe in 10 years or so things will look very different in the GF community and sourdough bread will be the best option! Also, and I apologize for asking so many Qs, I’m using your mock better batter as my all purpose flour, which has xanthan in it. so should i add the 1 3/4 t. xanthan called for in the first book as well? I’ve also got the GF bread flour mixture on hand (your recipe). Which gives me a better briioche result? I’ll leave you in peace now .. thanks. I really recommend you use the recipe, as written, in the bread book, Cat. Use the recipe in the new book, Cat. so maybe return the books then. I’m not following your comment, I’m afraid, Cat. Soooo excited to try this Paleo loaf! I love, love, love your blog but typically just drool over the recipes (but not actually try them) because I tend to follow more Paleo-geared recipes….so thanks for this one! Can’t wait to make this bread!!! Sasha, her Paleo recipes are awesome. I recommend the Paleo fudge, chocolate chip muffins, and doughnuts! I’ve suggested she come up with a Paleo single-serving mug cake. Don’t you think we need that, Sasha? Donia~ I’m a firm believer in the concept of a Paleo single-serving mug cake (what could be better than a Paleo treat in a single portion???) But, alas, I’ve not found a worthy mug cake recipe yet. Have you??? A Paleo mug cake recipe totally has my vote! Ditto. The microwave version I tried was dried out and just down-right bad…..
Oh, darn! I have everything in the house to make this!! Isn’t that just too bad?!?!? You know what I find hilarious about paleo? Is that chocolate is paleo!!! so hilarious. This is yummy looking I say, and thank you so much for all your hard work developing these – I marvel at you and your dedication every day. Question: What if my heat source is at the top or back of my oven? I have 2 wall ovens with a big fan in the back that blows out the heat (FYI: the top one is convection and I know I told you I had no clue if it was but then I looked and it is!). I 100% completely understand if you do not have a recommendation. Technically, only unsweetened chocolate is Paleo. Any varieties that are sweetened (even dark chocolate) have refined sugar in them. My guess is that most Paleo people feel that if they make the bulk of an item Paleo, the small amount of refined sugar in chocolate chips or chocolate glaze is fairly negligible. Though there are some Paleo people that don’t do ANY sweeteners at all, not even honey. But yes, for chocolate being so “sinful,” it’s surprising that it’s Paleo! Chocolate and bacon, hooray! I have a question about heat as well. I have a fairly new true convection oven. I would normally lower the temp 25 degrees for baking but there isn’t an option to be away from the heat. I’ll keep a close eye on it and cross my fingers. I would turn off the convection function, Jennifer. You should be able to use the oven without the convection function. Otherwise, I’m afraid I’m not sure how you should handle it. Convection ovens are not all alike. Sorry! This is so gorgeous. Anyone who bakes Paleo regularly will know exactly what you’re talking about regarding the texture issue. And almond extract + cherries = heaven. I look forward to making this!! Thanks, Donia! Oh, yeah, that’s the best bite for sure. And thanks for jumping in with a suggestion below! what if you don’t have tapioca startch flour. can you use anything else? Want to make this for Valentinees day and with the storms I won’t be able to get out to try and find it. Thanks. Nicole will say she hasn’t tested this with any substitutions. ;) I do a lot of Paleo baking, and if it was me, I would probably try arrowroot power (if you have that! ).